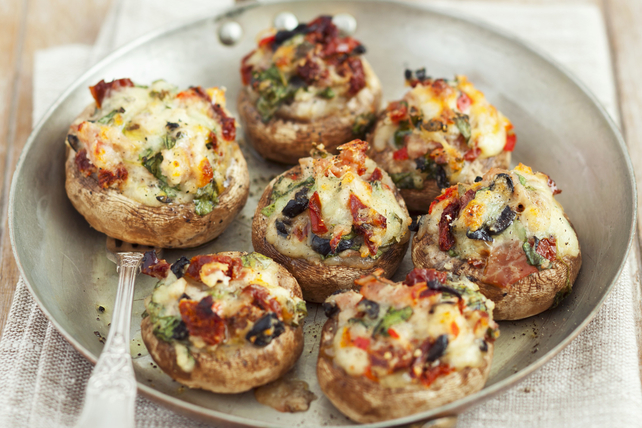 Get the party started with these savoury baked stuffed mushrooms, featuring a mix of cheeses, bacon, sun-dried tomatoes and Kalamata olives in tender mushroom caps. Reserve 1/4 cup shredded cheese for later use. Combine remaining shredded cheese with all remaining ingredients except mushrooms; spoon into mushroom caps. Place on baking sheet. Top with reserved shredded cheese. Bake 10 to 12 min. or until heated through. Remove from oven. Heat broiler. Place mushrooms 6 inches from heat. Broil 2 min. or until golden brown. Garnish with additional fresh basil before serving. Prepare recipe as directed except omit the bacon.